Meta tags in blogger are the core part of seo (search engine optimization) of your blog. They are not only helpful to the search engines to recognize the content of the website but also help human readers to know what is the main topic of your blog. Although here are of different types the most important and widely used are the tags used for keywords and description. The first one is for main keywords of your content and second one is for description part of it. The second one normally is more important than first because many search engines have left ranking pages based on the keywords. 1. 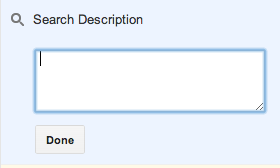 Log into the dashboard and go to settings and click on search preferences. 2. click on meta tags description, enable it first and then add the description text in the box not exceeding 150 characters, save and you are done. After completing the above step you will see some changes in the posting section, a new item will show named "Search Description" this is where you will have to write the description for your individual post that will appear in the search results.